Qualcomm’s latest Snapdragon 810 chip has been getting quite a lot of bad press ever since rumors sprung online saying the chip overheated. But even if phone producers like Samsung apparently took the whispers very seriously and chose to go with chips of their own making, companies like LG, Xiaomi and now HTC still decided to embed the Snapdragon 810 in their latest flagship products. Well, even as the Snapdragon 810 is barely out and about in the real world, as only the LG G Flex 2 is currently being made available to consumers, Qualcomm is taking the opportunity to talk about its next high-end chip at MWC 2015. In a keynote, the US chip giant unveiled the Snapdragon 820, which previously leaked in the wild a few months ago. The new chip will probably end up powering future high-end Android and Windows Phone handsets which will make it to the market towards the second half of the year. 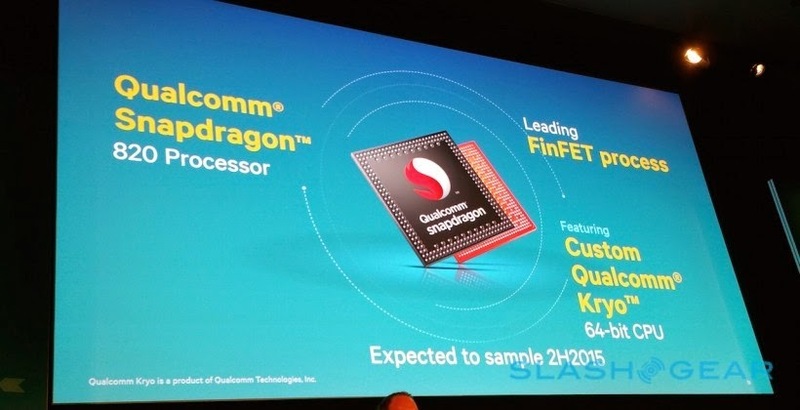 The Snapdragon 820 is the first piece of silicone to take advantage of a 64-bit custom Qualcomm CPU core dubbed Kyro. The chip is said to be built on non-planar FinFET architecture, so it will probably end up being manufactured by TSMC, which will use a 16nm process, or by the Samsung on 14nm. The new mobile architecture is also part of the all-new “machine learning” platform called Zeroth, which once implemented into a device, will allow it to “learn” and adapt to the ways you use and interact with it. Zeroth is basically a neuronal network capable of changing its behavior. All the data Zeroth will pick up will be stored onto the device itself and none of it will be stored in the cloud. For the time being, Qualcomm is seeing Zeroth go into smartphones and tablets, but it isn't ruling out a scenario where the platform will aid in the evolution of the automotive sector. So what’s Zeroth’s deal basically? Qualcomm demoed how the platform might interact with the camera. Zeroth would enable the app to recognize the people in a photo, dishes or architectural landscapes. If enough details are presented, the platform might be able to tell you where the photo was snapped. The Snapdragon 820 processor is expected to arrive in its sample form in the second half of 2015, so it’s probably going to be a while until the first phones bundling the platform make an entry in retail. Press Release:BARCELONA, Spain, March 2, 2015 /PRNewswire/ -- Qualcomm Incorporated (NASDAQ: QCOM) today announced that its subsidiary, Qualcomm Technologies, Inc. (QTI), will preview a series of next-generation mobile experiences at MWC 2015 through the power of the Qualcomm® Zeroth™ platform, Qualcomm Technologies' first cognitive computing platform designed to enhance on-device user experience. The Zeroth platform will be optimized for premium mobile devices based on Qualcomm Technologies' next-generation premium tier System-on a-Chip (SoC), the Qualcomm® Snapdragon™ 820 processor. Designed on a leading edge FinFET process node, the Snapdragon 820 processor will also introduce Qualcomm Technologies' custom 64-bit CPU architecture designed for premium mobile devices, the Qualcomm® Kryo™ CPU. The Snapdragon 820 processor is expected to begin sampling in the second half of 2015. "The premium mobile experiences of the future will extend beyond traditional features and functionality and be defined by devices that have the ability to learn and adapt to the needs of the user, through fully harnessing the growing levels of compute, multimedia and connectivity in our mobile devices," said Cristiano Amon, executive vice president, Qualcomm Technologies, Inc., and co-president, QCT. "At MWC 2015 we'll take the first steps towards realizing this vision with the Zeroth platform, and set the stage for a new level of intelligence and personalization for mobile devices. Zeroth intelligence will scale across a wide range of implementations from automobiles, wearables, smartphones and client computing and have a learned personalization that has the ability to transfer across devices and as a consumer upgrade to the next generation."